Indian Navy AA Recruitment 2019 (भारतीय नौसेना आर्टिफिशर अपरेंटिस भर्ती 2019- ऑनलाइन आवेदन फार्म, पात्रता, परीक्षा दिनांक और परीक्षा पैटर्न) The Indian Navy has the need to intelligent and energetic Unmarried Male candidates for Artificer Apprentice Post. So Indian Navy has recently announced the Indian Navy Artificer Apprentice Notification for the various posts in Indian Navy Department. Applicants, who want to join the Indian Navy, can go on the official website and complete the Indian Navy AA Recruitment 2019 Apply Online application form before the last date. You can check the Eligibility, Exam Dates & pattern details of Indian Navy Artificer Apprentice Vacancy from here. Latest Update: Indian Navy is going to issue the Artificer Apprentice Recruitment 2019 Notification for various vacancies. Interested & eligible candidates can complete the online application form before the last date. Job seekers who are waiting for Government Jobs, here the search is complete. The Indian Navy recruits the candidates on the Artificer Apprentice posts through the Navy Apprentice Jobs. You can check the details and apply for this post. Eligible and interested applicants are invited for the Indian Navy AA Application Form 2019 which will be completed in the online mode using the official website of Indian Navy. The application process will be started soon on the official website. Candidates must notices that the online application link will be disabled after the last date. Therefore applicants can complete the application process on or before the closing date. Read the whole article to get the complete details about the Indian Navy Nausena Bharti. Applicants who want to make their career in Defence Jobs can apply now for the Artificer Apprentice Posts from here. Before applying, you should check the Nausena Bharti Eligibility for the available posts which are given the below section. Candidates should be qualified in 10+2/ equivalent examination with 60% or more marks in aggregate with Maths & Physics and at least one of these subjects: Chemistry/ Biology/ Computer Science. The Age Relaxation will be depending on the Indian Navy Norms or Condition for the reserved category candidates. Indian Navy AA Application Form | How To Fill? Upload scanned the photograph, Signature, and all relevant documents. Applicant’s selection will be based on the written examination, physical test, and medical test. For the written examination here we have provided the Indian Navy AA Exam Pattern which helps the candidates in the exam preparations. The question papers will be objective type in the Hindi and English Language. The question papers consist of four sections. The question papers standard will be based on the 10+2 standards. 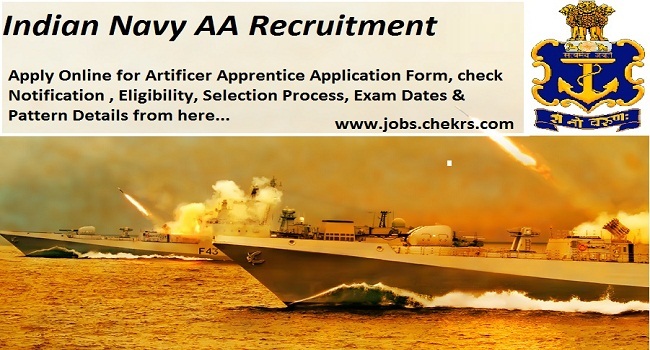 To get more details of Indian Navy AA Recruitment 2019 can keep visiting our site www.jobs.chekrs.com. We will provide you upcoming notification of Indian Navy Jobs, Indian Navy Engineers Jobs along with Indian Navy Upcoming vacancies. In terms of any query or review, we welcome your valuable comments in the commenting section below and we will get in touch with you shortly.